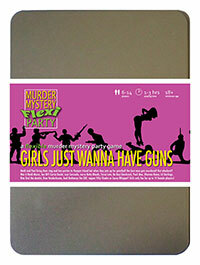 You've been invited to play the role of Fifty Shades in Girls Just Wanna Have Guns. Heidi and Paul are throwing their pre-wedding parties at luxury spa and adventure resort, Pamper Island. But after one too many drinks, the bride and her entourage are invited to 'hunt the stag' with paintball guns - and best man Steve Wingman meets a grisly end! Can you find out who murdered him? Grab your guns and get ready for a facial at the luxury spa and adventure resort of Pamper Island! You wouldn’t be caught dead without the latest hip-hop fashion, so pretty much everything you’re wearing has a designer logo. Jeans, t-shirt, trainers and, of course, shades are set off by some serious bling. Growing up on the mean streets of the suburbs of Milton Keynes, life has always been, well, pretty boring. Fading into the background was easy, feeling like another grey carbon copy of those milling around you, but it wasn’t enough. So you decided to don some shades, adopt a pretty sketchy Cockney Keynes accent, and reinvent yourself as Fifty Shades - a modern day rapper poet. Your first album, “Fifty Shades of a Colour I Chose at Home Base That They Can’t Remix Anymore” became a critical success overnight. I’m Fifty Shades and if you don’t know me, then open your ear right and I will go slowly. I’ve seen dub stuff in the burbs alright, but nothing like what happened to Steve tonight. I never went down to the woods today, some people are animals, the way they play. I mean who would Bogart one of me chains? It came from Argos, so feel my pains. It matches this bracelet so give it back, I wonder if it’s on that dead dude’s rack? I wasn’t even in the woods, I was talking to my manager. My next vinyl is dropping, it’s gonna be a damager.